Over the past three years, amateur astronomer Peter Girard has dabbled in off-world GIS. One product of his explorations is a celestial mapping project in ArcView GIS. Girard began developing his skymapping program when he bought his first telescope. In the process, he had to learn about astrometrics (measuring the positions of stars), celestial mechanics (the orbital motions of planets, comets, and asteroids), and how to manage these in a GIS context. He says, "It's been quite interesting to study the formulas and reduce them to Avenue scripts and MapObjects applications." 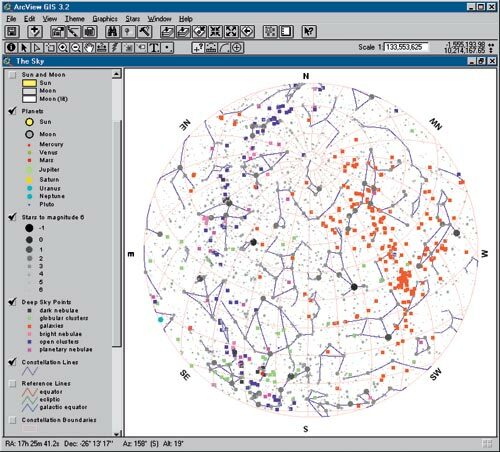 Prosaically called "av_stars.apr", Girard's project thus far includes shapefiles of galaxies, nebulae, planets, constellation boundaries, and nearly 600,000 stars measured by the Hipparcos satellite in the early 1990s. Most of the data for this project was processed into shapefiles from freely available data sources on the Internet. Create a map of the sky for this evening. Move to different parts of the sky by specifying coordinates or selecting a planet, asteroid, comet, or constellation. Determine the right ascension and declination for any point in the sky. Show the true extent of the sun and moon. Show the tracks of planets, comets, and asteroids as they move through the sky. This ArcView GIS 3.x project is freely available as two compressed files, av_stars.zip and big_stars.zip. Included are files describing the operation of the user interface and explaining the contents and sources of the shapefiles.